Soil health metrics were sensitive to long-term tillage practices. Biological indicators related to labile carbon and nitrogen were best correlated with crop yields. Soil health has been defined as the “the capacity of the soil to function as a vital living ecosystem that sustains plants, animals, and humans” (NRCS). The soil health concept recognizes that biological, physical, and chemical constraints must all be addressed for the soil to reach its full potential. Soil health assessment has become a powerful tool to diagnose biological and physical constraints in addition to the more traditionally measured chemical limitations (nutrients and pH). In 2017, Roper et al. published an article using Cornell University’s Comprehensive Analysis of Soil Health (CASH) approach to link soil health indicators to different agronomic management systems in North Carolina. The results from this experiment allowed us to explore the linkages between soil health and yield, which has remained an important gap in the soil health literature. Soil samples were collected from three long-term experiments (20+ years) in the coastal plain, piedmont, and mountain physiographic regions of North Carolina. Samples were sent to Cornell University to be analyzed for the standard CASH package, which includes two physical indicators – wet aggregate stability (AgStab), and available water capacity (AWC); four biological indicators – organic matter (OM), active carbon (ActC), autoclavable citrate extractable protein (Protein), and respiration (Resp); and seven chemical measurements (pH, and extractable P, K, Mg, Fe, Mn, and Zn). The results were made available in a supplemental table in the Roper et al. paper and re-analyzed by us. The coastal plain and mountain region experiments involved different tillage practices combined with organic vs. conventional management. 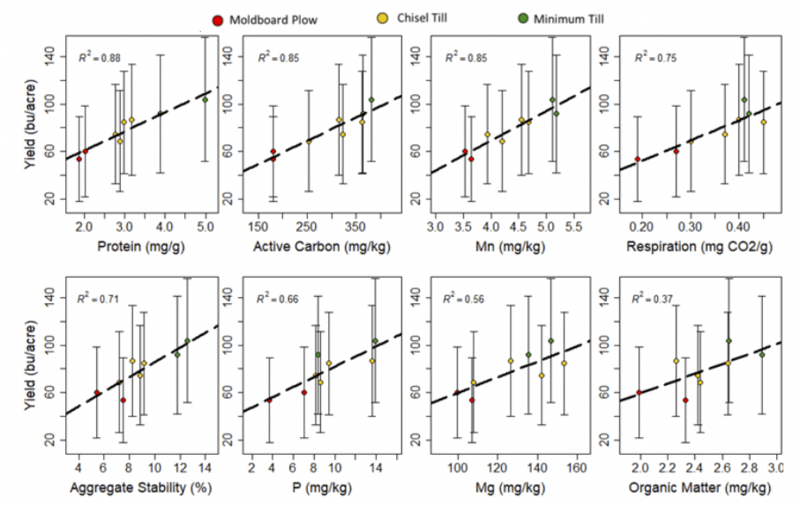 When the CASH values were analyzed, we found significant differences in AgStab, ActC, P, and Zn at each site (Table 1), while the mountain site also showed differences in Protein and several other chemical indicators. The effects on chemical indicators were primarily related to the organic vs. conventional treatments as compost applications tended to increase nutrient levels. But the physical (AgStab) and biological indicators (ActC and Protein) were mostly influenced by tillage practices. The piedmont experiment involved different levels of tillage intensity including moldboard plowing, chisel-till and no-till, and almost all CASH indicators were affected by the treatments (Table 1). Over all three sites, no-till treatments had higher soil physical and biological indicators than conventional tillage (data not shown). These findings are in agreement with many other studies that have demonstrated that CASH indicators are sensitive to management. Establishing positive relationships between soil health and crop yield is a difficult task because soil health effects are often masked by non-soil factors such as pest and weed pressures, erratic weather, and management effects. However, in the piedmont study, several individual CASH indicator values were positively correlated with mean corn and soybean yield (annual yield variability was not considered here). Specifically, eight CASH indicators (in order of correlation strength: Protein, ActC, Mn, Resp, AgStab, P, Mg, and OM) displayed significant linear relationships to mean corn yields (Figure 1). Each indicator tended to be highest under minimum-till, intermediate under chisel-till, and lowest under moldboard plow. This implies that reducing tillage positively impacted these SH indicators, which in turn benefitted crop yield. Most notable is the fact that the indicators related to labile carbon and nitrogen (Protein, ActC, Resp, and AgStab) showed the strongest correlations with mean corn yield, while total organic matter content showed weaker relations (Figure 1). This suggests that organic matter quality may be more important for improving corn yield than total organic matter quantity. When we analyzed the relationship between soil health indicators and mean soybean yield at this site, we found that Protein was a much weaker predictor of soybean yield than it was for corn yield (not shown). This makes sense because a legume crop would be less influenced by nitrogen supply from soil organic nitrogen sources (Protein reflects the largest such pool) than a non-legume crop. Additionally, we found that Mn showed a strong positive relationship to both corn and soybean yield, which is explained by Mn’s important role in organic matter decomposition. Figure 1. Linear regression of mean corn yield (bu/acre) as a function of different soil health indicators and tillage practices at the Piedmont site. Plots are organized from highest to lowest R2adj value. Error bars represent standard deviations associated with annual yield variability. Soil health data from three long-term field experiments in North Carolina showed that the CASH indicators were sensitive to agricultural management at each location, which is in line with previous results from our work in New York. Furthermore, soil health indicators were positively correlated with long-term average cash crop yield at the piedmont site, which illustrates the benefit of labile organic matter for crop growth. 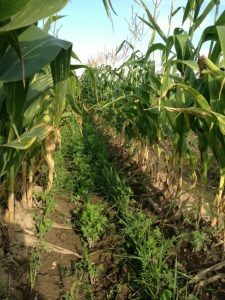 These results help to demonstrate the linkage between tillage, organic additions, soil health, and crop yield, which had remained an elusive goal. We acknowledge the work and funding of the original paper by Roper et al., 2017 (Soil Science Society of America Journal 81: 828-843). This article was based on Harold van Es and Douglas Karlen’s article titled, “Reanalysis validates soil health indicator sensitivity and correlation with long-term crop yields” (van Es and Karlen, 2019; accepted in Soil Science Society of America Journal). The condition of a farm’s soil has an important impact on crop production and the environment. Healthy agricultural soil holds adequate nutrients, absorbs heavy rainfall, and stores water. But in many annual production systems these functions are compromised by tillage that diminishes soil organic matter and creates compaction, ultimately restricting crop growth while increasing susceptibility to drought, erosion, and nutrient losses. Healthy soil, containing substantial levels of organic matter and beneficial pore space, can be developed over time by reducing tillage and using cover crops. But both strategies require significant investments of time and resources, while the benefits may require some years to take effect and are difficult to quantify. To help clarify exactly what costs and benefits farmers in New York experience when using these soil health-enhancing practices, we conducted a state-wide survey during the winter of 2017-18. Over 180 farmers from 46 NY counties provided information about the crops they grow, and how using reduced tillage and cover crops have impacted their farm business. From the survey results, we identified the most frequent expenses and benefits (Table 1). Note that costs and benefits reported in Table 1 go beyond revenue associated with yield, to include increases or decreases in annual input costs, as well as avoided investment costs (e.g., drainage systems). The most common benefit of both reduced tillage and cover crops was less erosion or sedimentation repair. Greater yield was reported by 52% of farmers using reduced tillage, and by 50% of those using cover crops. 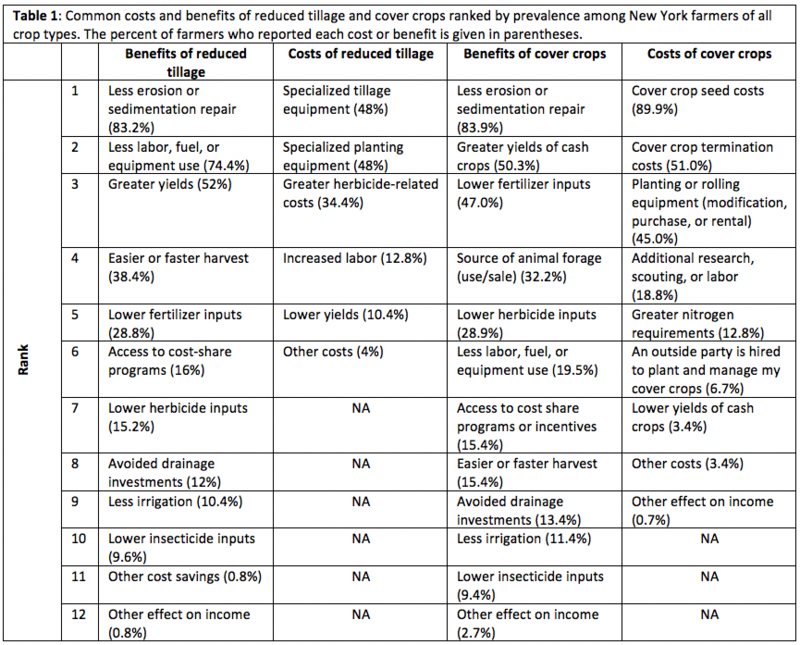 Lower yield was reported by 10% and 3% of farmers using reduced tillage and cover crops respectively (Table 1). When asked about profitability, less than 5% reported that either practice had a negative net impact (data not shown). Our survey also found distinctions in the costs and benefits depending on the type of cash crop being produced, for example greater yield of cash crops attributed to the use of cover crops was more frequently reported for vegetable systems than for corn and soybean, while corn and soybean systems in particular were more likely to benefit from forage uses of cover crops (data not shown). These results emphasize the differences that exist between cropping systems, and show that any decision to implement a specific soil health practice should be made on a case-by-case basis, carefully evaluating both the positive and the negative impacts that could occur following a shift in management practice. Some benefits that result from these practices are realized over many years as the productivity and function of the soil is gradually improved. We asked farmers how long they had been using reduced tillage and cover crops, and found that there was an association between the length of time a farmer had been using those practices and what benefits they saw. Farmers that had been using reduced tillage and cover crops the longest saw greater benefits. One such benefit is less erosion or sedimentation repair. While about 66% of farmers who had used reduced tillage for less than 5 years reported this benefit, after 10 years that number approached 100% (Fig 1). Similarly, among farmers who used cover crops, greater yield of cash crops was associated with long-term cover crop use (Fig 2). Figure 1: Reducing tillage helps protect against erosion, especially when practiced for more than 10 years. Figure 2: The use of cover crops can result in greater yields of cash crops, but this benefit is most common when the practice is in place for 10 years or more. We also wanted to know if farmers in New York state are improving their resilience to severe weather events by using soil health practices. Rainfall patterns in the region could change in the future, and we hypothesized that enhanced soil health provides protection against flooding and erosion from especially heavy downpours due to the presence of stable aggregates and the soil’s increased capacity to absorb water. That same healthy soil may also help a farmer during times of drought by storing water in the soil profile and making it available for crop growth. Both reduced tillage and cover crops were found to help farmers cope with extreme weather events, with over 60% reporting resilience benefits (Fig. 3). Figure 3: Over 60% of farmers surveyed confirmed that reduced tillage and cover crops help protect against extreme weather events. This study was conducted by New York Soil Health, and funded by NYS Dept. of Ag & Markets and Cornell University College of Agriculture and Life Sciences (CALS). To learn more about soil health in New York, visit newyorksoilhealth.org.